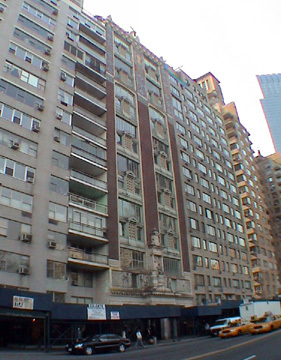 The city's best "studio" apartment building, this slender, 16-story building between 7th Avenue and Broadway was completed in 1905, a couple of years after several "studio" buildings were erected on West 67th Street. The Gainsborough has only 34 apartments, most with spectacular, double-height living rooms facing north towards Central Park. Designed by Charles W. Buckham, the building was developed by a group of artists led by August Franzen and is named after Thomas Gainsborough, the English artist, whose bust appears on the façade above the entrance as does an allegorical frieze by Isidore Konti. 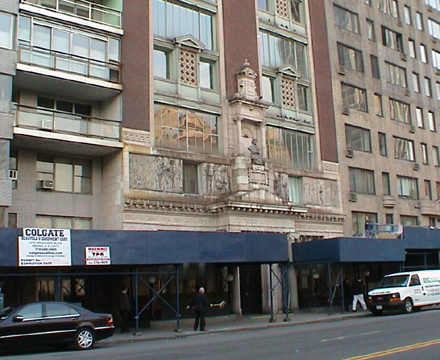 The building's façade is dominated by the huge, double-story windows, each of which has a small, attractive, pediment-topped doorway with decorative lattice-like masonry at their base that originally overlooked decorative, semi-circular, iron balconies that are now missing, giving the facade an almost Venetian look, which is further enhanced by the use of colored Moravian tiles on the building's top two floors. The building has a scalloped crown molding at its roofline. Its facade is particularly strong because of the three dark red-brick piers that frame the windows and give the relatively small building a strong sense of verticality. In the 1950's, the building commissioned Donald Deskey to redesign its lobby and entrance, but in the late 1980's spent about $1 million to restore them to their original appearance. In 1988, the building was designated an official city landmark. Although it is not the city's grandest "studio" building in terms of apartment sizes and materials, it is the best looking and has the best views. It is close to Columbus Circle and the Time Warner Center that opened in early 2004. It has no garage and no sundeck.